It is always nice when fate decides to favor the good guys for a change - and in Canada that is exactly what happened. Lewis Hamilton did BMW the favor of taking out himself and Ferrari's main challenger, Kimi Raikkonen, at the end of the pitlane, leaving Robert Kubica and Nick Heidfeld as the most likely winners. The BMW team have shown real quality this season, the car not quite as quick as Ferrari's and McLaren's, but they have stuck to their task and added to their point score regularly. It was fitting, too, that Robert should have been the winner of this, BMW's first victory, as he has been consistently quick and reliable from the first race this season. Nick has struggled, reportedly with getting tires up to temperature in qualifying, but this race may be the beginning of better days for him - he qualified high enough to be a factor this time. What struck me after the race was how popular a win it was; the closest to that feeling of universal approval was Kimi's championship win in Brazil last year. Perhaps we all enjoy seeing monopolies broken by the most deserving. The next test for BMW will be what follows: will they now live up to the expectations that will be generated by this first win? Naturally, I think they will. Today is a day for celebration, however. Say what you will about that man Hamilton but he always delivers surprises, doesn't he? And I don't mind admitting that he should have won, his superiority on this circuit being so obvious. BMW were going to get a victory sooner or later, however, and they earned this one by being there when it mattered. If there is any slight regret in the day, it must be that man Nick Heidfeld. He has worked so hard over the years for teams that were not winning, kept BMW close to the top two teams in 2007, and now, just as they attain the goal, the spoils slip from his grasp. As quick as Kubica is proving to be, Nick is still just as good, perhaps better, betrayed only by a driving style that makes it so hard to warm the tires quickly. For Heidfeld is a racer, the great overtaker and one of the hardest to pass. His fastest lap in Canada was quicker than Kubica's and his determined defense of his position against Alonso was a joy to behold. If he and the team can sort out his qualifying, he will stay with those currently contesting the championship. He did a good job today and, for a while, looked as if he would win. One has to be happy for David Coulthard, too. I don't quite know how he managed to sneak into third spot but he showed that he is not quite ready to bow out of the sport yet. If this is his last year in F1, it is only fitting that he should have a podium to remember it by. And I will say a word for Felipe Massa, too. Everything was against him in this race, a poor qualifying session, having to deal with traffic and more Ferrari mistakes, but he kept at it and took his opportunities when they came. He earned his four points today. Otherwise, the race was a lottery, the crumbling surface changing the characteristics of some corners every lap. Those who survived must thank fate as well as their own skills. As Mark Webber said ruefully before the race, "entertaining for the spectators..."
I was happy to see Kubica win and appalled at Hamilton's pit lane blunder. You gave to feel for Kimi, he was minding his own business after passing Hamilton in the pits and Lewis had an obvious brain fart at the end of pit lane. Massa had a nice drive up to 5th after Ferrari made a pit mistake of their own. Variety is good for the sport. Well, of course Kubica and BMW deserved this victory. But had it not been for the Hamilton/Raikkonen-accident, i think they might have had to wait a couple of races before it became truth. Yes, they were all lined up for their pitstops, but Hamilton had cleared a gap of about 5 or 10 seconds before the yellow flags came up. So, i think it would have been an even bigger challenge of adaptive strategies if they all had stayed in the race. Never the less, i'm full of respect and happiness for the sake of Kubica. He really is beginning to become my new favourite driver. Hamilton has lost that race a couple of races back since it became so obvious that he has a tendency not to take mistakes and foulups serious enough. Interesting analysis Clive. I think that was more of a racing accident, in the rain no less, and Hamilton's move was just plain bone-headed. Since we've all agreed that Kubica will win one race this year, we've jinxed him. If Hamilton is really getting a 10-spot penalty, BMW have a shot in France as well. This is getting interesting very quickly. Who knew a red light at the end of the pit lane was the most dangerous part of the track? Björn: Agreed that Hamilton's mistake gave the race to BMW, it is actually debatable that he would have won otherwise. He had been beaten to the red light by Kubica and Raikkonen, was fuelled more heavily than for the first stint (hence his stop taking longer) and would not have found it easy to pass the two ahead of him therefore. There is a case for saying that Kubica was already in a winning position when Lewis hit Kimi. But, in the end, we have to accept what reality hands out. 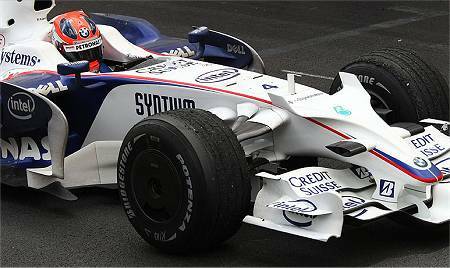 Kubica won, Heidfeld came second and BMW have taken a victory at last. A great day, especially if you're sick of seeing a red or a silver car cross the line first! Very good point about Hamilton's penalty for France improving BMW's chances in that race too. If Kubica wins the championship, perhaps he should send some of the champagne across to the McLaren pit! Funny, as soon as the chequered flag was waved, the first person I thought of was you Clive !I knew you'd be so chuffed. It was a great race, full of action & suspense. I just hope that next time it's Nicks turn. Oh, and of course that Alonso gets back on form too. Two opportunities squandered - no wonder those Alonso to Ferrari rumours keep getting louder. isn't it about time they make those pit lights a bit bigger? i mean this is high tech F1 with tiny old fashioned traffic lights. ooh it is so easy for us armchair enthousiast,isn't it? I wonder what it is about the red light at Montreal that makes it difficult to see? There have been a few incidents there over the years although they are general caused by the first guy to arrive not seeing it. Hear, hear, to your hope that Nick wins next time, Peril! As for Alonso, I think he is showing this year just how good he is. People are criticising him for the spin in Montreal but it just shows they don't know how hard he is trying. There is just no way the Renault is a match for the BMW at the moment, even when it has a fuel load advantage, and Alonso was on the absolute limit for lap after lap as he chased Heidfeld. The car was only in that position through Fernando's driving ability and to carp about a small error that resulted in retirement is to ignore the incredible effort being put in by Alonso. When you have to drive at the ragged edge all the time, of course mistakes happen. Agreed with both of you, Rob and Steven, that it seems the pit lights are not as easy to see as we might think. Now that they are being used so often, thanks to the idiotic safety car rules, the number if incidents involving the lights is increasing all the time. Part of the solution would be to position them better and make them larger but it would help a great deal if the SC rules were brought back to something more reasonable. It does bug me when so many criticise a driver's error from their armchairs. F1 is probably the most demanding of all sports when it comes to intense concentration over long periods and to write off drivers after mistakes that may seem incomprehensible is just evidence of a lack of understanding of the driver's task. Nobody wrecks his own chances by crashing deliberately. Look at the way Massa was derided after the first couple of races this season - now, suddenly, he's the golden boy again. It is just so silly. Drivers don't change completely over a matter of two weeks. I think you make a good point about Alonso. What he is doing with that piece of garbage is incredible. I am not surprised Piquet is struggling when he is trying to get to grips with a recalcitrant car and his team mate can be of little help because he is doing the impossible in it every time he sits in it. I would like to see Alonso in a decent car next year he doesn't deserve to have to drive that heap. He just has to learn that no team is going to treat him like he is Senna. He has kinda painted himself into a corner, hasn't he? I can't see him getting a good drive until 2010, realistically. Unless Kimi does a shock retirement or something like that. The moment I saw the chequered flag, you were the 1st to come in my mind. BMW 1,2, Dr.Mario soaked in champagne and McLaran with 0 points. I couldn't dream of a better race, yes, Lewis was not that quick to brake and fans would passionately or madly offend/defend him in forums, but good F1 fan would know he didn't do anything wrong, neither did Kimi in Monaco. If we can see the Munich based outfit becoming champions or runners up, and STR/Red bull, toyota/honda finishing top 5, I couldn't get happier..
'I didn't realize so many of you guys were aware of my support for BMW' I knew long before, when you cheered for Kubica's qualifying pace, and praise driving skills of Nick. I love them both, so am in your boat. But when you wrote the passionate article about Dr.Mario, when everyone were writing about Lewis or Ferrari, the world knew your stand Clive. 'must tone it down in future' why clive? Should be proud to have supported a good upcoming team, without controversies (atleast till now). Why not? Also, one titbit I came to know from the GP was, every other team but BMW has pit crew teams, one for each driver, that would compete against each other in measuring their work. But BMW is the only team wherein there are no groups but everyone works for both the cars. How good is that? Maybe the groups could create competition and better results in pitlane, but would also create rivalry and unneeded incidents. Apparently not, Arun - BMW are also known to be the quickest pit stop team in the game, so much so that Ferrari were rumored to be watching their procedures a while back to see how they were doing it. 'I didn't realize so many of you guys were aware of my support for BMW' – Oh I've felt that you have been trying to subvert your readership into becoming BMW fans for a while! As for the number of red light incidents at Montreal; I think it is probably a combination of a) having many more safety cars at this track than any other and b) the configuration of the pit exit (coming after a slow turns 1 and 2) meaning that the train takes longer to clear the pit exit than at more regularly configured tracks. Good points about the frequency of red light incidents in Montreal - and this gives us an opportunity to see many of the problems that can occur with safety cars. Ah yes, I didn't word that very well. Alonso is doing an amazing job with that dog of a car - what I meant was that Renault are squandering his point scoring opportunities with blown engines, gearbox failures and the like - and therefore no wonder he is considering other options. I actually thought Piquet did a reasonable job this weekend - until his car packed it in, of course. I think the way Piquet's race was portrayed on the TV, it seemed that his spin caused his retirement. In fact, and as we found out later, the gearbox packed up. Until then Piquet had been doing pretty well, sharing the honors for passing manoeuvres with Heidfeld, and it's a pity that his race was not better rewarded. I think you make a good point about Renault's poor reliability this year, Peril, and can only presume that the pace of development is getting to them. But I think Alonso is stuck with the team, at least to the end of 2009. We shall see. It was portrayed that way initially Clive, as it happened during an ad break - ggrrrrr. Bring on the BBC coverage ! It was only later we found out that the gearbox was the issue. Speaking of Alonso & Ferrari, LDM was a guest on the Charlie Rose show last evening and when asked who the best drivers were responded: Kimi, Massa & Alonso the Spainard. When Hammy was mentioned he said yes, he was a good driver but he and his team make too many mistakes. Interesting? Don: Interesting, yes; accurate, I don't think so. It's not as if Kimi and Massa have been error-free over the last year or so, in fact, their mistake tally is probably higher than the McLaren drivers'. Luca is just aware that he will never be able to employ Hamilton and should pour scorn on his efforts therefore. Luca has to mention his pair in his list of the best three drivers - he hired them, so if he doesn't think they're good enough, who will? I'm not convinced yet that any team will want to pick up Alonso for 2009 or 2010. Maybe it's not fair, but he's not managed to repair his reputation yet due to his car falling to pieces on a regular basis. I was sorta joking about BMW, Alianora - nothing would stop me writing about the team. But I need to stay aware of the other teams and give them a fair crack of the whip too.